Now we have moved into our brand spanking new office we have started to plan the interior, brighten up those blank walls, and search for some wonderful and fun items we can dot around the place – so we thought we might add some little friends of ours. One of our senior designers, Paul, has created the magical World of Carbon as part of our brand, along with a marvellous suite of characters. We have been investigating ways to introduce this world into different areas for both print and digital, one idea we wanted to pursue is to have our characters made into little models to be placed around the office, or used as practical devices to hold phones, tablets etc… We have looked into various options, but after attending a Cannon 3D print seminar (see Harriets blog) we think that this would be a good opportunity to embrace a new technology. 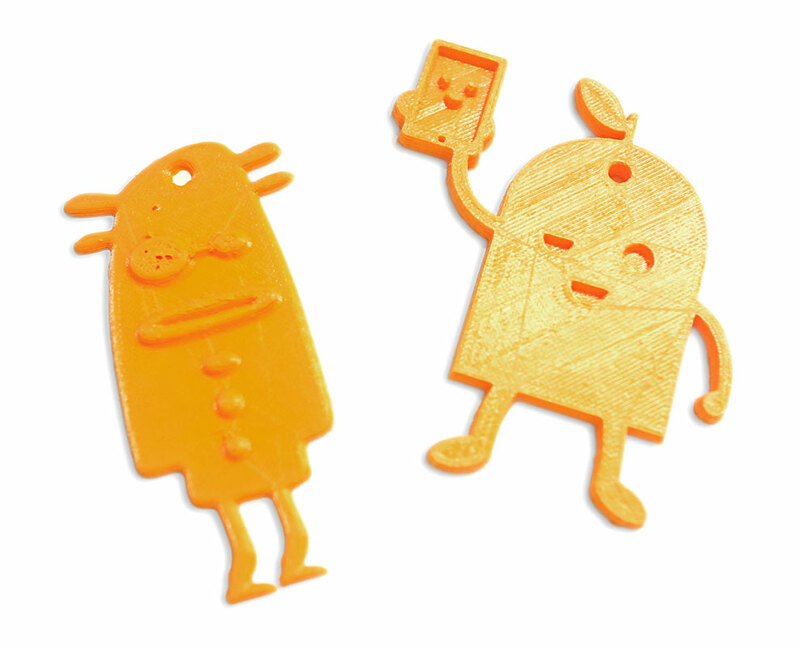 We wanted to have a go at 3D printing ourselves, to get a good feel for it before we decided to proceed, Fab Labs offered a day course that we found through Eventbrite. Fab Labs provide digital manufacturing technology, combining 2D and 3D design with the latest fabrication technology. They can give you a place to work, provide or teach you the skills needed, supply the materials and the technology to produce things cheaply and quickly, they also make this available on a local basis to anyone who wants to create something new or bespoke. Due to the time needed to print a 3D object, our first task of the day was to design something simple that could be printing while we carried on with the rest of the course. We were guided through a bit of software which is very much like Adobe Illustrator called Inkscape, but it’s free and is a great option if you don’t want to subscribe to Adobe Creative Cloud. We were then asked to produce the designs in greyscale, which the 3D print software can use to detect the height for various areas of the design. Whilst our designs were printing, we were introduced to a new bit of software called Autodesk Fusion 360, it is the first 3D CAD, CAM, and CAE tool that is cloud based. We were tasked with modelling a pen drive case from instructional slides for each step of the process, being novices we struggled through producing an end result! We exported our model as an .stl file (the PDF equivalent in 3D world, we were told). As it takes such a long time to print anything in 3D, we unfortunately couldn’t print these out because our characters will still printing. Since attending the course, I have modelled our first Carbon character to be printed – so all that is left for me to do now is to get some print quotes and decide how to add a finish to the print! Please keep an eye out on our social media timelines for the end result. Hey! I'm Nolan, one of the Senior Creatives at Carbon.